– therapeutic schools and substance abuse treatment. 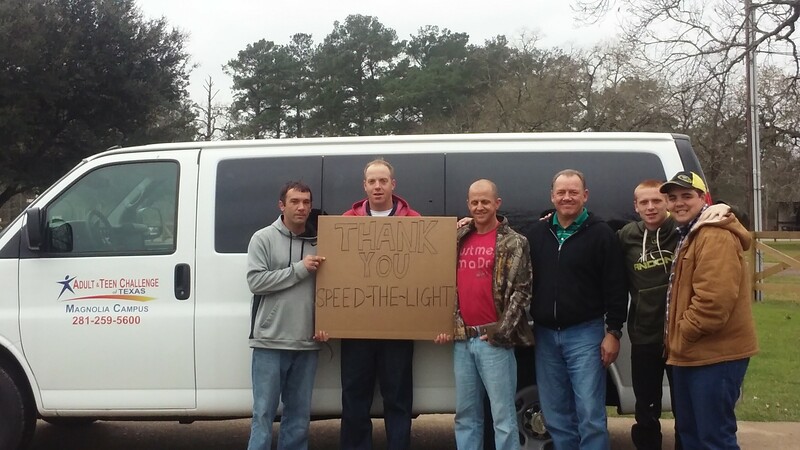 The Magnolia Men’s Campus would like to shout out a big THANK YOU to Speed the light! Speed The Light recently donated a new eleven passenger van! This provides the Magnolia men’s campus with a reliable vehicle to transport our Adult & Teen Challenge of Texas students and to disciple others into relationship with the Lord. Speed the light (STL) began in 1944 through the National Youth Ministries department of the Assemblies of God as a way to give youth the opportunity to help missionaries spread the gospel message to the lost. STL is the student-initiated, volunteer, charitable program that provides much-needed equipment to those on the front lines of ministry. Since its beginning, STL has raised over $253 million for missionary equipment around the world By providing essential and reliable transportation, ministries like Adult & Teen Challenge of Texas can better fulfill the Great Commission and speed the light of the gospel to a world in darkness. We can also help you in your search for other drug rehabs, Christian drug and alcohol rehabs, Christian drug rehab treatment centers, or drug rehabs near me. Should you need help finding Christian rehabs, best rehabs, rehabs for alcoholics or Christian rehabs, please let us know.